As any cold-weather liveaboard boater knows, the biggest ordeal of the winter season is not surviving the freezing temperatures, but the condensation. About halfway into our first wet winter on Pas de Deux, Benn became obssessed with the idea of installing a multi-fuel burner in our boat. His argument was that a stove would not only heat the boat, but also dry out the air. As an added bonus, we would be able to use driftwood and other free sources of fuel to power it. I was opposed to the idea, mainly because we already had a diesel heater and installing a stove would require making permanent alterations to the boat — i.e. cutting a giant hole in the coachroof. I am also not overly impressed with the coal industry, what with its dangerous working conditions, dumping of mining waste in streams and rivers, and general ravaging of the natural landscape. Since Benn was the one actually living on the boat through the winter, he eventually won out, and now Pas de Deux has a new multi-fuel stove. I have to admit that the stove has turned out to be a great heating solution. It is much warmer (and cheaper) than our diesel heater, and, after running the fire for a few hours, it literally burns off all of the moisture throughout the boat. I have also been assured by a medical authority that burning a coal fire will not give me cancer, which is a plus. Benn chose a rocket stove, which he bought on eBay because of its super compact size and extremely low price (£50 delivered in the UK!). It also loads from the top, which means there is less likelihood of coal falling out of the stove if the boat rocks. Since we will only be using the stove while moored and catamarans tend to be pretty stable, we feel the stove is a pretty safe option for us; I don’t know if the same is true of monohulls, although we have seen a few out and about with piping chimneys, it’s certainly possible. First off, Benn built a hearth using concrete fireproof board. The next step was tiling the fireplace. Tiles are possibly not the best design feature on a boat, mainly because they are heavy and breakable. At the same time, they prevent fires from breaking out and burning down your boat, which certainly works in their favor. 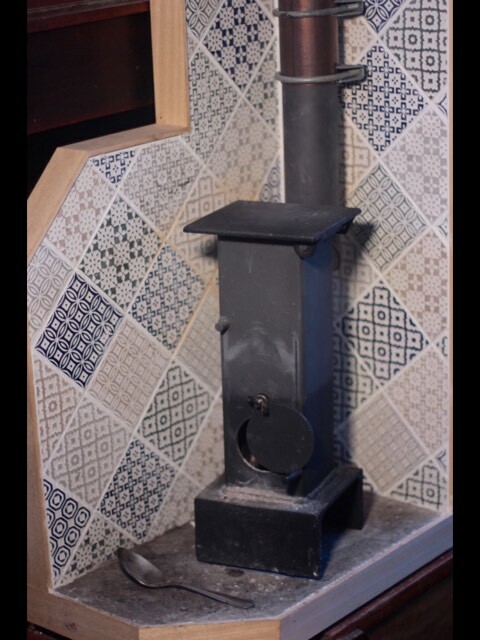 We were hoping to find tiles that were a bit old-fashioned and decorative — something with a 17th century Dutch feel, although obviously we would settle for Victorian. We were not at all prepared, however, for the cost of decorative tiles. Luckily, after a bit of online shopping, we were able to find some perfectly adequate tiles for only 25 pounds. I had always assumed that tiling required some kind of magical professional expertise, but, as it turns out, like most DIY, it is basically a glorified arts and crafts project. In fact, it is pretty fun and easy, and, thanks to my general craftiness and experience as a camp counselor, I proved to be EVEN BETTER AT IT THAN BENN — a happy discovery. Look at that tiny cut! We surrounded the tiles with a wood trim to make the edges look nice. We were able to cut everything very nicely and neatly with a Japanese handsaw that my uncle, a super talented woodworker, recommended to me for building picture frames. It is really pretty incredible and capable of handling almost all of the wordworking we have to do on the boat. Now, all that is left to be done is to put a lip on the hearth to prevent coal from falling out and catching the boat on fire, smooth and trim some rough spots on the plasterboard where the sander wouldn’t fit, and saw the chimney down so that the boom can actually pass over it once we finally go sailing (just a minor issue). We are also in the market for a hood to prevent things from falling down the chimney, although, miraculously, so far no rain, snow, or seagull faeces has found its way into the flue. After using the stove for a few months, we can happily recommend installing one on your catamaran. Its impact on condensation is nothing short of miraculous and it also heats the boat well in a relatively short time. On more than one occasion we have looked over to find Fuji panting, a sure indication that we have exceeded maximum husky comfort level. The main downside of the stove is that it is small and therefore requires frequent tending. The flue comes out at a right angle from the stove and sometimes bits of coal get stuck in it. Our diesel heater is much faster and easier to use (as in, it requires flicking a switch), but it is also expensive, noisy, and not all that much warmer once it gets going. Also, neither the diesel heater nor the stove has much of an effect on the areas outside of the saloon. Because they are both located “up,” meaning in the top part of the cabin, most of the hot air hovers around the deck and never travels down into the amas or staterooms. To solve this problem, we’ve had to buy a tiny oil-filled radiator (only £10!) which we keep going in the stateroom to take some of the chill out of the air. We also use a little USB fan to help circulate the air around the boat. All in all, the stove has been a very effective heating solution, especially when it comes to burning off the moisture in the air. Of course, we hope to one day find an even better solution, involving getting the hell out of England and sailing to someplace with warmer winters. Next The Saga of Pas de Deux, Chapter 15: Cut adrift! The adventure begins! Way to go you two! Fuji looked a bit unimpressed, but what does she know? I mean what does she know about stoves? She knows nothing about stoves! She does hate being cold, though, so you’d think she’d appreciate it more!